It's great Pleasure for All of us here at MultiM Systems Bulgaria to announce the Launch of our new Website! 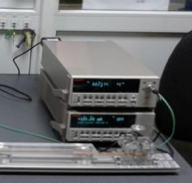 System for measuring the resistance of electrical cables. The system for measuring the resistance of electrical cables (Cable Resistance Meter), CabResMeter-1M, is designed for automatic and semi-automatic resistance measurements for single core, multi core, tape, bar or any other type of electrical cables. This system is usually used for 1m length cables, but it can also be used for measuring resistance and resistivity of cables with different lengths. The system for cable fixing and connecting, LowResCabBench, is flexible and customizable, which allows the usage of the same equipment for different types, lengths and sections of the cables under test. It can be connected to both Keithley and AMETEK/Sorensen current sources. The system provides additional information on the resistance and resistivity values, including the change in value over time with regards to temperature variation, due to its feature for direct measurement of cable temperature. In addition , CabResMeter-1M enables generation and printing of test reports and/or building experimental database. This system for measuring resistance of electrical cables is based on the requirements stipulated by the IEC 60468 international standard. CabResMeter-1M allows both manual and PC-based semi-automatic operation using the specialized software application LowResCabTest. 1. Current source – model Keithley 6220 / 6221, for test currents of maximum 100mA or AMETEK/Sorensen, for test currents larger than 100mA, up to 3000A. 2. Nanovoltmeter – model Keithley 2182A, for measuring voltage drop across the measuring points – channel 1, and for measuring temperature of cables under test – channel 2. 3. System for fixing and connecting cables under test – model OFRIM Engineering, LowResCabBench, customizable according to the shape and dimension of the cable under test. To find out latest news about OFRIM Group, please visit www.ofrimgroup.com. Remember that you also can subscribe to our newsletter.